Arise and shine, I can just hear my mom saying those words as I covered my head with the blankets. Never all that happy to get up in the morning, here I am in 2018 as a priest of our Holy Church, leading a wonderful family of faith in our worship of God through His Son, Jesus. Of course that means I have to get up early. It’s worth it! The prophet Isaiah, using the words above, was speaking to the dejected people of Israel. They were in captivity in Babylon, with covers over their heads. He tells them to get up, to wipe the sleep from their eyes, to shine because an amazing thing was happening. They were being saved, recalled from exile. They were being called home. This happened to us that first Christmas. We were called to take on a new attitude. No more pulling the covers over our heads. The time of Jesus is here. We are being saved. Salvation had come, redemption is being accomplished. All we have to do is get up and meet and accept Him. Funny things happen in life. Sometimes not too “haha” funny. The light dims, the warmth cools, and we start pulling the covers over our heads again. When that happens we have to recall these words from Isaiah. We have to reconnect with the Manger, the start of great light and warmth. We have to gather the courage to engage in worship and community once again. The New Year is here. We are being called. Time to arise and shine. Join us during this Christmas season (all forty days of it). We celebrate the Circumcision of the Lord, the Holy Name of Jesus, the Epiphany, and the Baptism of the Lord. The SouperBowl of Caring is coming up – help us feed those in need in our local community. Take part in our annual Outrageous Valentine’s Raffle. Stop by for a great homemade spaghetti dinner. Schedule a home blessing. Learn about our music scholarships. Become a member and sign up to help serve the community. We so look forward to meeting you. Time to arise and shine! You may view and download a copy of our January 2018 Newsletter right here. One of the wonders of Advent and the Christmas season is Why. Why did Jesus come to earth? Why did God allow Himself to be humbled in such a way as to take on our humanity, to be born in a stable, to proclaim eternal truth to a people who would not listen, to be mocked and persecuted for that message, and to sacrifice Himself? In the most simple terms, it is about completion. The dictionary defines completion as ‘the action or process of finishing something.’ God did all these things to complete us; to bring about the fulfillment of God’s plan for humanity. The Church does not often speak of eschatological things – the end times and Jesus’ return – but as we focus on the moment of salvation that started coming ever closer in the stable at Bethlehem, we are called to do exactly that. Advent preparation is meaningless if it is just about Christmas day, or the forty day season of Christmas. We are to be preparing ourselves and living for complete completion. What began that night 2,017 years ago was God’s offer of all we need to get there. What we are to do today, throughout Christmas, and every day is to witness and cooperate in moving toward the completion Jesus offered and offers. We stand in this intermediate time. We are the link. Together we build the bridge from the joy of Christmas, the exaltation of resurrection, to completion. Join us in prepare through Advent and begin the celebration of the Christmas season (all 40 days of it). We have our annual pot-luck vigil dinner on the 17th, a great breakfast on the 10th, and many other special events including our traditional candlelight midnight Holy Mass (really at midnight). Take a look at some of the reflections as well – like ‘Why be a member of this Church.’ Ever wonder, ever think about the answer – check it out. We so look forward to seeing you. You may view and download a copy of our December 2017 Newsletter right here. That very day, the first day of the week, two of Jesus’ disciples were going to a village seven miles from Jerusalem called Emmaus. We begin April in Passiontide and end up on the road with the Risen Lord. Isn’t that the way life often goes? We live unfulfilling passions, both attractive and sad, until we find the joy and fulfillment of Jesus. As time passes, old and new passions emerge and sometimes we forget our resurrection joy. We find ourselves in passiontides. This month we rediscover the amazing news of the resurrected Lord. Easter is here. More than just a day in April, it is a present continuous moment. We are called to continuously remove the passiontide veil, see Jesus among us, and live on Jesus’ amazing, eternal, and glorious road. His present Easter! Join us in completing our Lenten walk with Jesus and join us in rejoicing in His resurrection. Check out our Passiontide, Holy Week, and Easter events, participate in directed giving, reflect during these days, and then commit to doing great things throughout the fifty days of Easter. You may view and download a copy of our April 2017 Newsletter right here. Five years – I can hardly believe it! We have been hosting Back to Church Sunday each September since 2012 and this will be the fifth time. Will we see each other there? I certainly hope and pray I will see you. The writer of the Letter to the Hebrews exhorts us to assemble together for public worship. The group that assembles for worship will be the very group that is assembled on the last day. Meet together now so we may meet together at Jesus’ return. The apostle says that we must regard it as a sacred duty to meet together for the worship of God. No causes should deter us. From this sacred social duty grace is received, we are strengthened, our light is increased, and our heavenly inheritance is confirmed. See you September 18th at 9:30am or 11:30am. You may view and download a copy of our September 2016 Newsletter right here. May 2016 Newsletter – What does it take to be satisfied? Still on the early newsletter streak – one day early once again. “Be satisfied with what you have.” Our moms didn’t want us to be jealous or covetous of others. Instead they wanted to focus us on our blessings – what we have – and most especially on all that God has done and has in store for us. Good lessons for life of course given out of love. Don’t chase after empty things – focus on what is really important: faith in God Who brings all things to perfection. With Him we have family, community, true knowledge, and our work is blessed even if the world doesn’t see it. The explicit promise in our being “satisfied with what you have” is God’s provision for us. God will reach to the last grain of sand and the remotest star to bless us. I will never run away from you He promises. During this month we consider the depth of God’s provision. Even if the entire world has abandoned us, even if our mom were to reject us, God remains at our side. You may view and download a copy of our May 2016 Newsletter right here. Summer is coming to an end and Fall is around the corner. We look to one of the greatest Feasts established by our Holy Church – the Solemnity of Brotherly Love. September brings the first ever national webinar on Brotherly Love (register here), a continuation of our Holy Masses for Healing, Back to Church Sunday, a new Bible study, and prayerful recollection of the 14th Anniversary of the Tragedy of 9/11, and many other events. Also in our newsletter – congratulations to our young people who won music scholarships, the start of Sunday School classes, and a report on our summer activities. Get updates on Church-wide events for this year of regeneration and much more. You may view and download a copy of our September 2015 Newsletter right here. 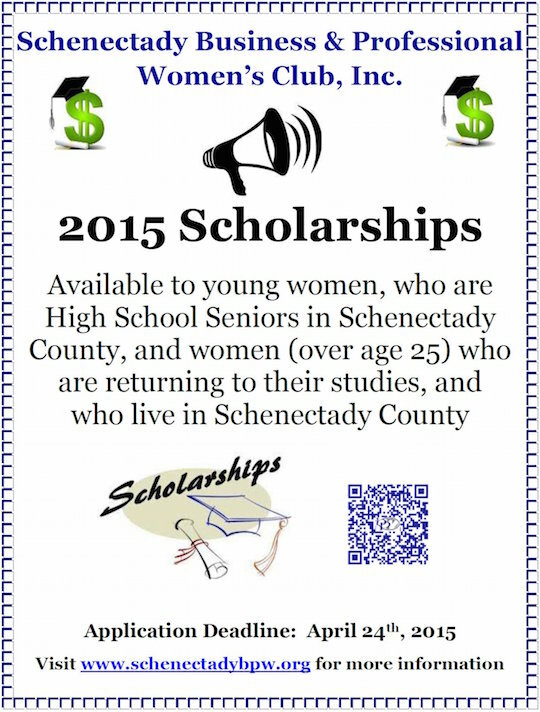 The Schenectady Business & Professional Women’s Club, Inc. announces its 2015 Scholarships available to young women who are High School Seniors in Schenectady County, and women (over age 25) who are returning to their studies, and who live in Schenectady County. The application deadline is April 24th, 2015. The Knight Foundation provided the CUNY Graduate School of Journalism with a generous three-year grant to run a summer diversity program — and they are actively recruiting for the Class of Summer 2015. They are looking to bring 20 aspiring journalists to New York City. They will pick up transportation costs and put up the students in on-campus housing for the two months that the program is in session in June and July. These students will receive training from the CUNY J-School faculty and participate in paid media internships that the J-School will help them secure. To be eligible to apply, candidates must have attended historically black colleges, Hispanic-serving institutions or be members of any journalist of color organization. There is a competitive twist to the program in that the top five performers will be offered free tuition to study for their master’s at the J-School. The application deadline is February 16. January 2015 Newsletter – Happy New Year! Happy Abundant Life!!! January, we are left with a question. For all we have learned about abundant life in our Lord and Savior, Jesus Christ, will we decide to participate in that abundance? The New Year always presents an opportunity to make a turn, to pledge our lives to Christ and to membership in His Holy Church. This January we continue our celebration of the forty days of Christmas, we expand our Holy Mass schedule, and we continue our charitable work. Come be lavished with abundant life in your church – right here in Schenectady. You may view and download a copy of our January 2015 Newsletter right here.